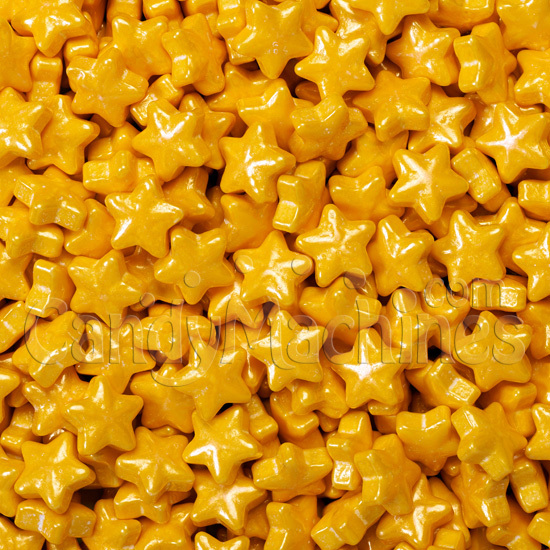 Star shaped pressed candies with a shimmering, glossy coat...perfect for weddings, holidays, and other special events. These shimmer gold Sweet Shapes candies are a quality vending candy for upscale locations. You may also purchase by the pound if you need fewer quantities. Need a machine to vend these candies? Made by SweetWorks, this bulk vending candy is gluten free, made in a nut free facility, and OU Kosher Certified. The candies typically vend for 25¢ in commercial vending machines that have an adjustable candy dispensing wheel which controls the number of pieces that vend per quarter. They will also dispense in our candy banks and dispensers. Candy is best stored in a cool, dry, low humidity location. Their shelf life can be up to 18 months if not exposed to extreme hot or cold temperatures.